Why can’t I wirelessly stream audio from my Android phone directly to my hearing aids? Can hearing aids be stylish? Hearing aid manufacturer Signia believes so. Social stigma is one of the reasons a large percentage of people with hearing loss avoid getting hearing aids. 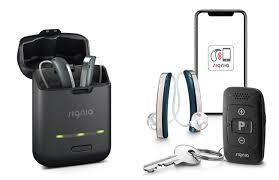 Signia is trying to change this with the release of the Signia Styletto which is a new hearing aid that Signia describes as “high tech hearwear”. The Styletto was launched in Australia on the 1st of October 2018. The Signia Styletto is attempting to transform the image of hearing aids from stigmatised medical appliances that are a sign of disability, to stylish fashionable “hearwear”. Sounds of Life Audiology in Brisbane managed to get early access to Styletto prior to its official launch in Australia on the 1st of October. Below are our initial thoughts about these exciting new hearing aids. Styletto has been designed with a premium “look and feel”. The devices look more like high-quality consumer electronic devices than hearing aids. They have a beautiful high-quality brushed-metal finish with the Signia logo embossed into the housing. In addition, their unique slim-RIC shape is a significant shift from traditional hearing aid styling and shaping. Traditional hearing aid styles are influenced significantly by the hearing aid batteries they use. These batteries come in a small range of standard shapes/sizes; 10, 312, 13 and 675. The Signia Styletto breaks away from these designs by using a special “rod- shaped” lithium-ion battery. This enables Styletto to be much slimmer and sleeker than traditional hearing aids. The Signia Styletto has been designed with practicality in mind and for people “on the go”. Its lithium-ion battery gives the wearer up to 19 hours of wearing time per charge. Signia has cleverly designed its charger into the Styletto carrying case. To recharge, wearers simply need to insert their Stylettos into the carry case and they will be fully charged in 3 hours. If wearers are running low and do not want to do a full charge, a quick 30-minute charge will provide wearers 5 hours wearing time. The Styletto charger “carry case” concept is certainly a practical system for active people. The carry case is so small it can be put in the wearer’s pocket while it recharges their Styletto hearing devices. In addition, the carry case’s internal lithium-ion battery provides enough capacity to offer three full charges of Styletto before itself needing recharging (via a USB connection or mains power). This means that if wearers are going on a short camping or business trip, they can have up to four full day’s autonomous “plug-free” use (do not need to carry extra cords or a power supply). There are no user controls on Styletto’s sleek housing. If wearers want to be able to adjust the settings of their Stylettos, they can do so either via the free remote App; TouchControl App, or the miniPocket remote control (needs to be purchased separately). The TouchControl App is compatible with both Apple and Android smartphones and offers much more control over Styletto’s features compared to the miniPocket. Unlike the miniPocket which offers control over volume and programs only, the TouchControl App also offers wearers full control over Styletto’s microphones. Wearers can focus the directional beam of the microphones and their direction. This is a very useful feature for wearers who struggle in background noise and want to focus in on the person they are listening to. Own Voice Processing – the Stylettos can detect when the wearer is speaking and automatically adjust its sound processing, so the wearer perceives their own voice more naturally (less “boomy” or “echoey”). Narrow Directionality – in situations with a lot of background noise, the Stylettos are able to narrow their directional beam so it focusses on the person in front of the wearer and reduces unwanted noise or conversations. This feature operates automatically, but wearers can also control the width and direction of the beam via the TouchControl smartphone App (described above). It should be noted however that unlike most current high-end hearing aids, Styletto does not support Bluetooth audiostreaming. Wearers cannot wireless stream music audio or phone calls into the devices. Styletto is a very interesting hearing aid that could possibility transform the image of hearing aids. Stigma is a significant issue preventing a lot of people with hearing loss wearing hearing aids. Styletto’s stylish and fashionable design will likely appeal to many people that may have been reluctant previously to wear hearing aids due to their look. Styletto does not compromise on audiological performance and its practical design (with portable lithium-ion rechargeability) will appeal to active people “on the go”. Styletto is available in one power version suitable for hearing aid wearers with mild to moderately-severe hearing loss. They come in three performance levels: Styletto 7 (Premium), Styletto 5 (High-End) and Styletto 3 (Mid-Range). Please note Styletto is only available in a binaural kit with charger. Sounds of Life’s pricing for Styletto can be found here. Being fully independent – We are not owned or operated by a hearing aid manufacturer or large chain. Ethical Practices – We are focused on providing the highest level of care and do not pay commissions. We also follow the Australian Government Hearing Services’ protocol for hearing services. If you feel hearing loss is impacting your life contact Sounds of Life.